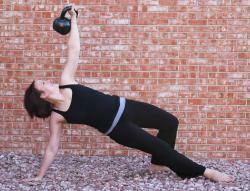 I offer personal training in Colorado Springs at the Kettlebell Plus training center, as well as in-home training. Anything that overloads the body will create change. Simple, basic and true. I focus on the form and technique of how the overload is being applied to make it safe, fun and effective for my clients. I have two Kettlebell Certification through HKC and IKFF. I also graduated from the National Personal Training Institute of Colorado and got my NSCA cert. A native and lifelong resident of Colorado Springs, Amanda Hawkins holds an NSCA, HKC and IKFF kettlebell certification and graduated from the Colorado National Personal Training Institute. She also holds a bachelors of business from the University of Colorado. Amanda’s love for physical fitness and the outdoors have always influenced her leisure activities which include hiking, mountain climbing, biking, league tennis and volleyball. After the birth of her son, she chose kettlebell training to “burn the baby fat” and regain lost strength and muscle tone. Two months later she found herself “addicted to the bells” and in the best shape of her life. Amanda leads her classes with an easy smile and outgoing personality. The new trainee will benefit from her patience and persistence while her energy and intensity will challenge even the most seasoned trainee.